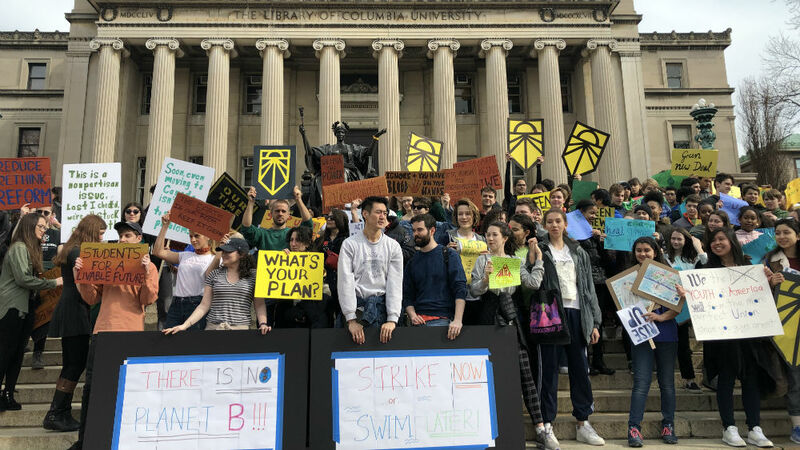 New York City – Before taking the microphone to address a climate rally at Columbia University on an unseasonably warm Friday, the only US presidential contender whose campaign is singularly focused on the climate crisis made some pithy observations. “This is the epicentre of change right here,” said Washington Governor Jay Inslee, looking at the high-school and college students holding bright placards and basking in the March sunshine. 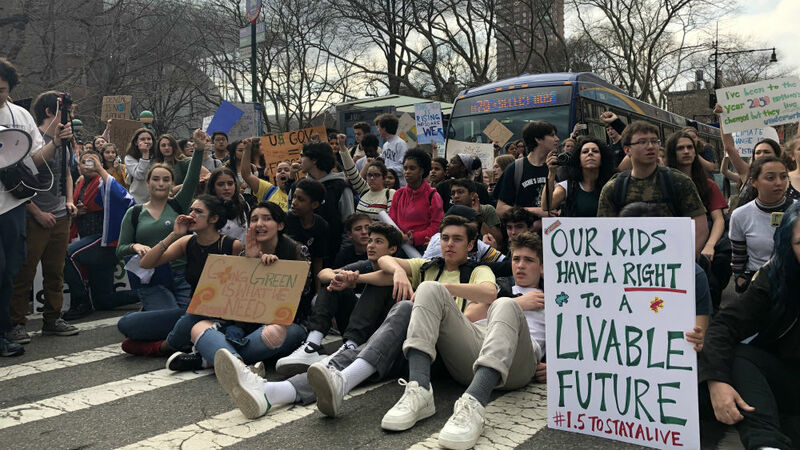 In New York City, the March 15 climate rallies took place in front of the United Nations, at City Hall, several university campuses, and then culminated in a march from Columbus Circle to the Museum of Natural History. The day of global action was the first time that significant numbers of American protesters joined their worldwide counterparts, with events in a dizzyingly long list of international locations. From Nauru and New Delhi to Munich and Mexico City, students inspired by Swedish activist Greta Thunberg walked out of school and took to the streets. Otto Held, 15, was on hand to help organise the young people. He described government leaders as “disrespectful to my future, my children’s future”, and added “previous generations haven’t had to deal with this”. One of the groups participating in the day’s events, Extinction Rebellion, took a more aggressive stance to ensuring environmental progress – by promoting non-violent direct action and civil disobedience. Karlos Edmonds was in attendance at the Inslee speech, waiting in the wings until an opportunity to make waves. 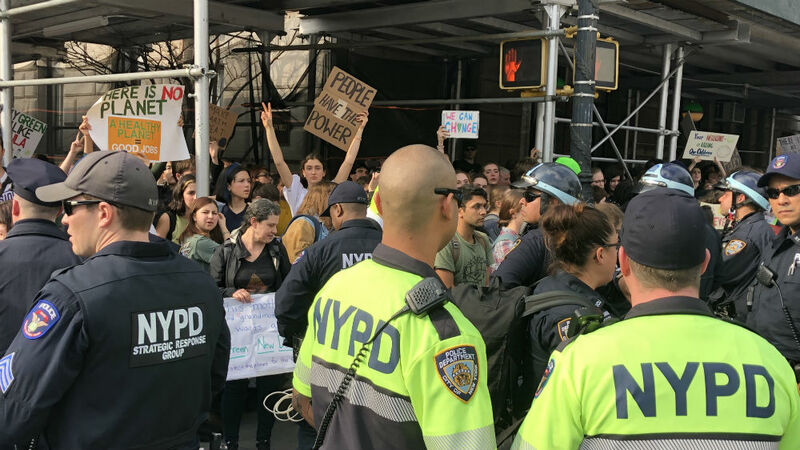 Later in the day, he was one of about 17 people arrested by the New York Police Department for disorderly conduct and blocking traffic, after a crowd of several thousand rallied on the western edge of Central Park. Other demonstrators took a more practical approach to the Green New Deal resolution proposed by Congresswoman Alexandria Ocasio-Cortez and Senator Ed Markey. And legislators in the nation’s capital also got to see their fair share of climate strikers. Nadia Nazar, a 16-year-old student from the suburbs of Baltimore, Maryland, is co-founder of Zero Hour, a youth-led environmental justice movement. She joined the main event in Washington DC next to the Capitol building, punctuated by an 11-minute moment of silence to signify the 11 years left until even more disastrous effects of a warming climate. However, the marine biologist’s daughter – who testified in February to the House Natural Resources Committee – restated that goal in a more modest way: “To get a good portion of the fossil-fuel industry transitioned by then. Ryan Madden, 24, is an organiser with the Long Island Progressive Coalition who also volunteers with the Sunrise Movement. “As a person of privilege in the Global North, in the country most responsible for the [climate] crisis“, Madden said his goal for a worldwide reparations programme is “to go above and beyond in the reduction of carbon emissions”. Madden said the Sunrise Movement is emboldened by having a “fossil-fuel apologist in the White House” and will continue its 15-state tour, largely focused on “strategically making [climate] a wedge issue in the next Democratic primary”.